This is the third installment in our new series, Five Questions. 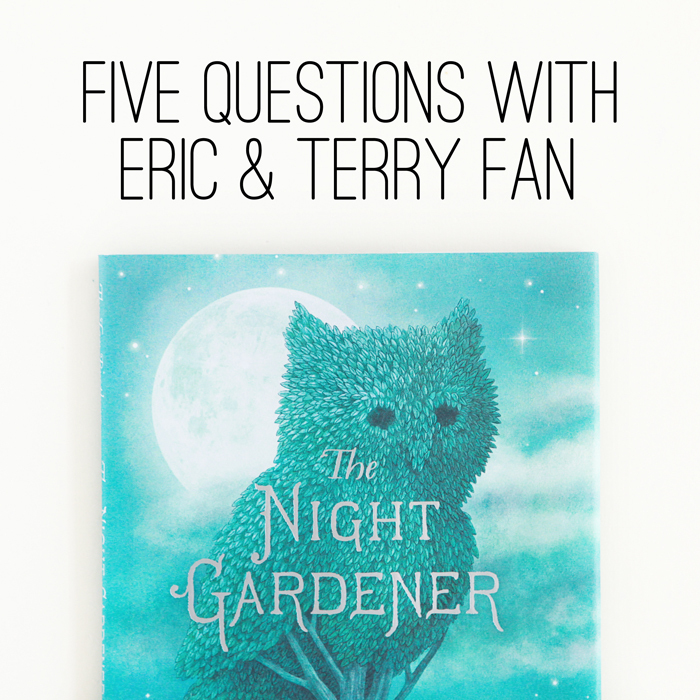 Today we're interviewing Eric and Terry Fan, brothers and illustrators of The Night Gardener. I hope you all enjoy getting to know the people behind the book and the "story behind the story" as much as I have. 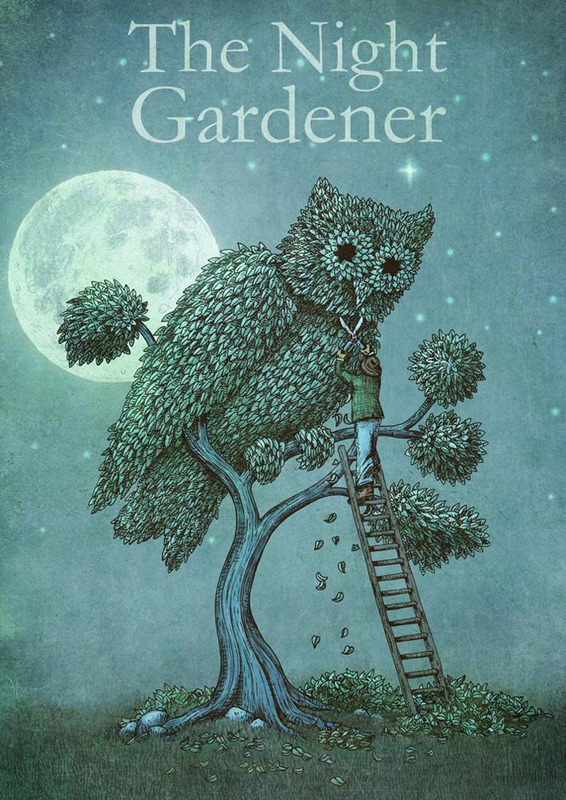 What inspired The Night Gardener? 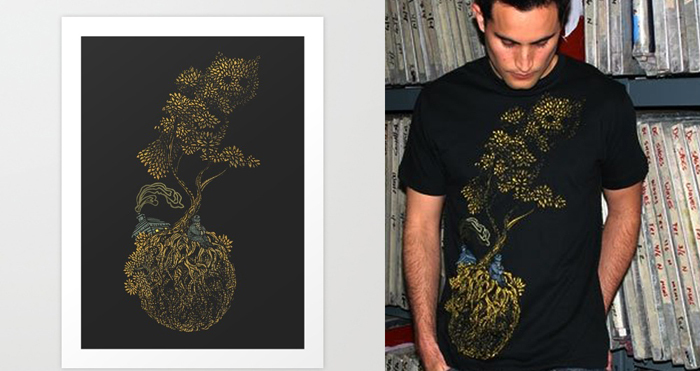 Terry liked the image and we decided to do a collaboration together based on it called "The Night Gardener." It was a stand-alone image, but even at the time we thought there might be a story around that image, but we really didn't give it a lot of thought until many years later when our agent, Kirsten Hall, saw our work online and asked if we wanted representation. She had just started her new agency Catbird Productions, which represented artists in the children's book field. She asked us if we had any story ideas for a book, and the drawing we had done of the man shaping a tree into an owl came to mind. When we started thinking of the story to build around that image, our dad became the primary inspiration for the character of the Night Gardener himself. Our dad is a philosophy professor, but is also a parrot-breeder, a skilled potter, a bee keeper, and most of all has a special love of nature and trees. He retired back to Taiwan fifteen years ago, but growing up in Toronto our house was always filled with plants, trees, and various bonsai. I think he missed the lush greenery of Taiwan in Toronto, and compensated by turning our house into something of a jungle. There was even a parrot flying free, and a hummingbird named Woodstock that he had rescued, along with a tame chickadee named head-a-hopper who was true to his name since he would fly from one person’s head to another. Previous to this, Terry had done the cover and chapter illustrations for a book called Rooftoppers by Katherine Rundell (Simon & Schuster). Lizzy Bromley was the art director for Rooftoppers, so when Kirsten pitched The Night Gardener, she decided to approach Lizzy and also editor Christian Trimmer. Luckily for us they loved it and the rest is history. What was it like collaborating with your brother on the art in The Night Gardener? The question we probably get asked more than any other is "how do you two work together?" For us it seemed quite natural since we've worked collaboratively on many projects since we were kids. Our first collaboration was actually a picture book we made when we were very young called Many Years Ago. It was a book about dinosaurs, naturally. Terry and I did the drawings and our mom did the text and put the book together for us. We also decorated our bedroom walls with drawings of fish and whales to turn it into an undersea world, and we spent hours creating imaginary worlds that we drew maps for and planned down to the last detail. So working on The Night Gardener was part of that continuum. As far as the actual process of the book, sometimes we worked on the same drawing together, and other times we'd complete separate elements independently. Our illustrations are done partly in a digital environment, so that gave us the flexibility to marry different elements of a drawing into a composite whole, using Photoshop. Can you tell us a bit about your new book The Darkest Dark and how you came up with the art for the story? The story is about Chris Hadfield, and how he overcame his fear of the dark, and what inspired him to become an astronaut. The story comes from his childhood, based on actual events (seeing the moon landing in 1969 while at his cottage on Stag Island) so we wanted to get the environment right and have a certain level of verisimilitude. Luckily the Hadfields were incredibly generous and invited us up to their family cottage on Stag Island, which has changed very little over the years. It was a great source of inspiration and reference. We saw his childhood bedroom, the neighbour's cottage where he actually watched the moon landing, even little details like the dinner bell his parents used to call the family to the dinner table. Chris also took us flying one day in a four-seat Cirrus, and I got to pilot the plane for ten minutes, much to Terry's horror. After gathering all the pertinent reference, and talking to Chris about his childhood, it was then a process of integrating the autobiographical details with the imaginative elements of the story, and finding a way to visualize a boy's fear of the dark in a tangible way. Any new books or projects in the works? Right now we're working on a wonderful book called The Antlered Ship, by Dashka Slater. It's being published in the Fall of 2017 by Beach Lane Books, an imprint of Simon & Schuster. After that we have our next book with Simon & Schuster that we wrote ourselves called Ocean Meets Sky. Thank you, Eric and Terry, for stopping by to chat with us. We're looking forward to The Darkest Dark!